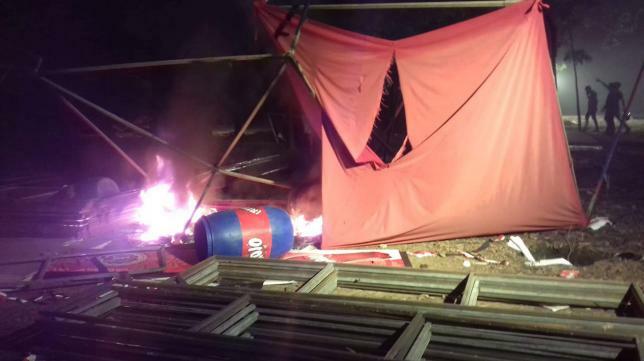 Some activists of a faction of Bangladesh Chhatra League allegedly set fire to a stage made for a concert to celebrate Pahela Baishakh on Dhaka University campus and also vandalised around 13 refrigerators of the sponsor company, reports The Daily Star. The incident occurred between 12:45am and 1:00am at Mol Chattar in DU yesterday. He also demanded those who are involved in the incident should be identified and brought under the purview of law in 24hours. Asked about the organiser of the concert, Nur said Ducsu has no involvement with the programme. However, a number of posts shared by BCL men on social media mentioned that BCL in association with Ducsu organised the concert on the occasion of Pahela Baishakh coming up today. Dhaka University’s Proctor AKM Golam Rabbani said they are looking into the matter. Meanwhile, BCL leaders, wishing anonymity, said supporters of BCL president Rezwanul Haque Chowdhury Shovon were behind the incident.